This proposal is a part of the general program carried out in the Inner Delta of the Niger by PROTOS, that started in 2004. - low capacities with local authorities to plan , implement and management local development projects, e.g. drinking water projects. - to strengthen the capacities for planning and management of the local authorities and civil society. 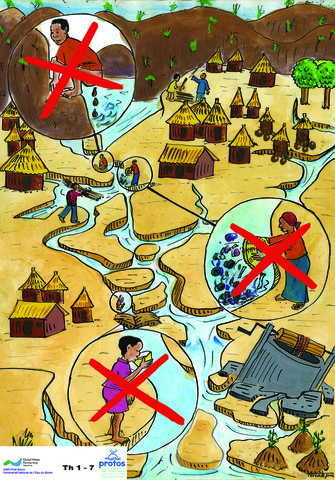 The present proposal builds on the experiences and resultants of the previous phase, and concentrates on the one hand on a better access to drinking water and sanitation for the disadvantaged population, often forgotten by other programs, and the sustainability of the infrastructure, within in framework of Integrated Water Resources Management. - 14 municipalities strengthened in different aspects of local development. The entire population of the 6 municipalities of this action will benefit from the increased management capacities of their local government. The staff of the NGOs, and the selected local private sector will benefit from training programs and employment. Our approach builds on more than 30 years experience in the water sector and is based on strengthening the legitimate roles of the different actors (local government, regional government, civil society, private sector, and water user associations) within an integrated water resource management framework. It is adapted to the Mali context and follows the Mali decentralization and water strategies. This approach is characterized by progressively placing the responsibility for planning, coordinating, and monitoring water and sanitation interventions at the municipal level. - the works are carried out by local contractors through an open tender procedure. PROTOS and the engineers from the Regional Water Directorate provide technical expertise and monitor the studies and the works and assure quality control. The actions of the private sector are coached and controlled by the PROTOS project staff. The water users elect a committee responsible for distribution, operation and maintenance. Each water user pays an annual fee to this committee which goes to an operation and maintenance fund, which is managed by a water user association (federation), federating the individual committees. Each municipality signs a contract with the water committees operating on their territory that specifies rights and duties of water users, water committee and local government. Local technicians have been trained in maintenance and can be hired by the water committees in case of repairs. Promoted by the Mali Government. The project will be done in one phase, funding will not be split in parts. - creation of a village committee for the management of the water point, elected by the village. A technical engineering firm recruited by the municipality in on open tender, draws a technical study for the water point, which has to be approved by PROTOS, the municipality, the Regional Water Directorate and the village. A local contractor is recruited by the municipality for the construction of the water point. The works are controlled by PROTOS and the Regional Water Directorate, and accepted by the Municipality and the community. The community participates in the works with non skilled labor, local materials and food and shelter for the local contractor. The municipality pays 5 % of the investment. The municipality signs a contract with the water user committee (WUC) for the management of the water point. This management is regularly appraised by the municipality. The water users pay for the water (on a monthly basis or per recipient). - the delegation of the management of the water points to the local committees and its follow up. The Regional Directorates play its role as a back stopping office for the municipalities, and in controlling the implementation of national water & sanitation policies on the field. The local authorities and the Regional Directorates are member of the steering committee and decide on the strategy of the project, and guarantee the interaction with other interventions in the area (both governmental as non-governmental). Maintenance: in regard to water infrastructure and management, the overall operation and maintenance will be fully funded by savings made by users. The Management Committee in relation to the Regional Hydraulic Services, fix the price, taking into account recurrent costs and the price within the region. The Management Committee, based on preliminary calculations made, will be able to meet all expenses for maintenance and regular maintenance of infrastructure. It also will have a surplus to deal for extraordinary expenses. In this case the action will involve Micro Finance Institutions to collect and secure the revenue from the point of village water committees. Experience has shown that water committees were afraid to carry large sums of money to the village, which exposed the treasurer to multiple stresses. The price of 10 CFA per recipient 20-25 liters often applied in the Delta is accepted by the population for a drilled borehole. With an average consumption of 20l/day/person, the cost of water per person per day is 10 F CFA (USD 0.019) or 3.650 F CFA/ year (6.95 USD / year). 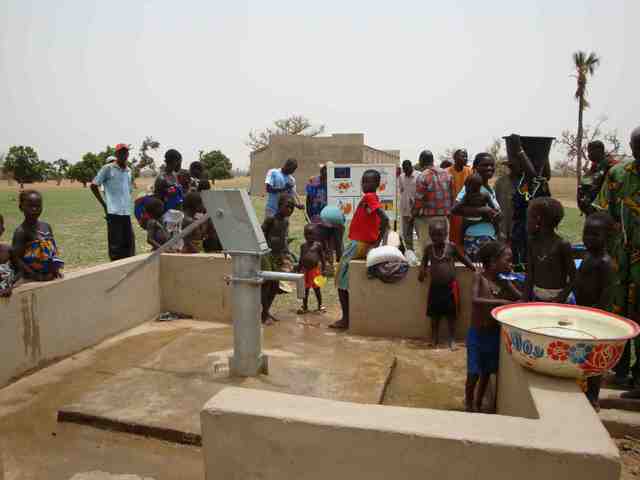 In the case of a village population of 400 people, the annual revenues collected are exceeding the average annual maintenance cost of a borehole. In the case of a well, the applied system is a monthly payment per family, which amounts to a monthly minimum of 0.41 USD per family. Often, contributions are organized according to the need for maintenance, or repair, and the estimate proposed by the repairer. The required contribution is then distributed per family. The municipality is the legal owner or the water systems but delegates the operation and maintenance to the drinking water committee on village level. On municipality level, a drinking water association (federation) is formed by the individual committees are member. This association gives support to the individual committees (organizational, technical and financial). The drinking water committees collect the water fees, and deposit them in a saving account of the drinking water association. In case of a breakdown of the drinking water infrastructure, the drinking water association pays the repair cost. The committee hires a local technician for the reparation. These local technicians have been trained by PROTOS in previous projects. The water association (federation) has a central store with spare parts. Local technicians purchase the necessary spare parts at this shop. Why does it appear that no water will be provided to school children? There is not much point to teaching school kids about hygiene and sanitation education (HSE) if they don't have access to good water and latrines at school. The same thing applies to public latrines in markets and other public areas. The cost of providing HSE is relatively low (especially on a per capita basis, and its benefits can be quite high, especially in terms of reducing water borne diseases, and promoting handwashing with soap. Personally, I think that if a particular community or the local authorities are not willing to actively participate in the promotion of HSE, particularly washing hands with soap, then the community should not be provided with other WS&S services, as the benefit / cost ratio would below. Another comment is the annual financial contribution per family towards maintenance fund. This contribution toward the O&M costs. It is usually much more difficult to collect monthly O&M fees, rather than saving them up until the end of the year, because of the value of the contribution will be perceived as onerous. Water tariffs should be part of the monthly water consumption costs. It's easier for people to contribute smaller amounts over a longer period of time. Hi. I like that you are including EcoSan as an option for people as it is something we are currently working to introduce in Sierra Leone. With regard to the EcoSan, what types of designs will you offer homeowners and what type of training will be provided where people don't have experience of EcoSan? Also, will the homeowners be involved in the construction of the latrines or will the latrines be built entirely for them? In Sierra Leone we have found that people may need help with digging safe pits, but are willing to provide the superstructure themselves - which avoids previous problems where owners have had little ownership of new concrete latrines and subsequently don't use them. we are always considering EcoSan. See also what we wrote in the section "Used technology". 1. Need far more space to be constructed. The villages in where people live during the 5 months that the area in the Inner Delta is flooded, are so crowded, that there is hardly any space left over. 2. EcoSan is more expensive than pit latrine. Training and formation is organised by subcontracting local NGO's, which in their turn are first formed by CREPA, a West-African applied research institute, and very active in the whole West-African region ( CREPA = Centre Régionale pour l'Eau Potable et l'Assainissement à faible coût. This is a very interesting and comprehensive proposal. You have stated that the community makes a request to the municipal authority who then make an appraisal according to a number of technical, financial and social criteria. Could you give some more details on the specifics of this criteria? What sort of indicators would make a community more likely to be successful? The final choice of annual interventions is made after deliberation by de municipal council and then approved by a steering committee of the project which consists of the mayors of all participating municipalities, the relevenant government departements, and the project. Hope this has answered your question, if not don't hesitatie to ask for more précision. Regarding the rehabilitation, do we have any data on when the water points were constructed and what led to them needing rehab? Are there any learnings from that degradation process? Hopefully there were not a previous project and beneficiary impacts are being double-counted (as has happened with another project by a different agency). Its important to learn from your 30 year experience which factors lead to the decline of the water points and other facilities. How are you engaging with the local government? How is it going to results in different behavior by them to learn and take ownership (or share it with the community) to that the systems last long? I wish we could see the results of your earlier work 2006-2010 on strengthening 14 municipalities. What is the status of the projects done in 2006? - problems in design and building: not enough knowledge of the aquifers and soil layers and fluctuations in groundwater levels (and flooding levels) in time due to rainfall, climate change leading to drying up off wells or badly placed wells. An underdeveloped and not very performant private sector leading to faulty construction. - all the boreholes equipped with the india hand pump are functionnal, we have had one or two which have become flooded during an exceptionnel season. Careful choice of implantation (geophysical study, flooding scenarios, soci-cultural considerations) is very important! - it is very important that people know why they're paying O&M, what the costs are for what they're paying for (local technicien, spare parts), where they can get this, and that they know that the money they're paying is in good hands (as little as possible should be kept with the treasurer, making use of micro-financing institutions). Make all these procedures as simple as possible.This is a process which takes time to appropriate and should ideally be followed for some time after completion of works. - we have built some wells which dry up at the end of the dry season or which have some construction flaws (ie incorrect dosage of cement). For the latter type of problems it is important that supervision/control of works during building by local contractors is well organised! Local government involvement: this is in fact one of the key elements of our approach and in fact the local governments are our "contracting partners"; through "learning by doing" local government are responsable for the whole project cycle to plan, realise, and manage drinkwater and sanitation infrastructures and interventions.This entails that we provide support on developping the sectoral 5 year "Plans de Developpement Communal", preparing a yearly "Plan d'Action et d'Investissement" (what ressources do we have, priorisation of needs, where shall we build what). After the planning has been made and approved by the council we support local government in mobilising the service delivery: they recruit a local NGO for the extension work, a local consultancy firm for the technical studies, and a local contractor for the building. Most of this is done through open tendering procedures with supervision by PROTOS and relevant government departments. All contracts are signed by the mayor, the actual payments are delegated to PROTOS after authorisation by the mayor (this is for practical purposes since communication and banks are limited, in Benin for example, PROTOS also transfers the funds to local government). After completion of works the local government officially hands over ownership of the infrastructure to the water user committee and they sign a "convention" which stipulates de conditions (obligations for operation,maintenance, control). The local government has then a supervisory role and in case of mismanagement can choose for another form of management. Beneficiary impacts double counted; this is not the case, the project we propose will start jan 2011 (and end dec 2011) and the beneficairies are those villages where we will built an infrastructure for, or rehabiltate an infrastructure which does not provide water anymore, during the first year of this three year program. The current programme in 14 municipalities, financed by the EU Water Facility, will close at the end of this year. The first two and a half years were largely used to build the large number of infrastructures and accompanying the newly elected local governments. During 2010 we concentrate further on reinforcing the management structures put in place for the more complex infrastructures (waste water sewage systems and "adductions d'eau villageois" ), on the federation of water user committees, and on water ressource management conventions between user groups. I'll try and upload some more pictures. 1,700 people equals 170 families, which is 10 (ten!!) persons per family. Is that right? Actually the term we should have used is household (ménage); which in the malinese context usually consists off several houses on a compound where a part of the extended family also lives. On average there will be 4-5 adults and 4-5 children. 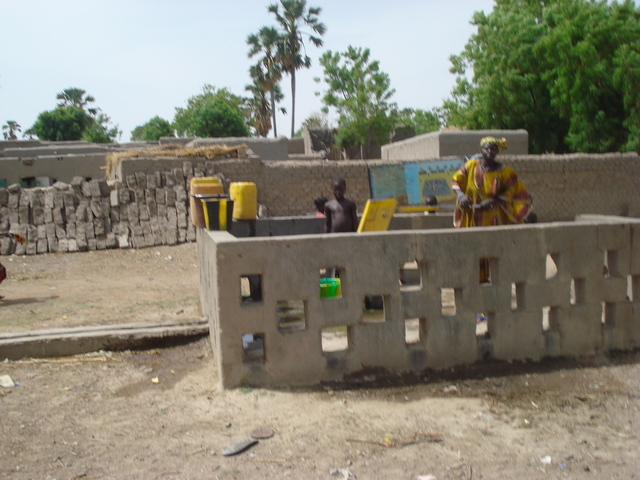 I agree with your comments above, in our program in Mali we now focus on HSE in schools (teaching teachers and supporting childrens health clubs) accompanied with providing handwashing facilities and storage facilities for drinkwater. We have been working in these municipalities for several years now and all the schools have latrines and acces to drinkwater. Note however that only the largest villages in this regions have schools. About the water tariffs: it is actually the community itself which decides which mechanism to adopt. For drinkwater systems with higher O&M costs like boreholes with diesel or solar pumps the water is usually paid for per jerrycan at the fountain. For boreholes with handpumps and shallow wells the community fixes a price per family per year (based on average 0&M costs) which can either be paid in installments or, as is usually the case, in one go after the rice harvest has been sold. The first one is that there is no place where it is clearly indicated whether the NGO is the one who is directly responsible for design, execution and/or finance management or if it is contributing, encouraging, helping organize, etc other actors. PWE member are supposed to be either field executors or funders. A field executor of course can and should involve, train , mobilize local actors but it has definite responsibilities and corresponding financial burdens. I am seeing more proposals in which the actual responsiblities and what the French call are not defined.. The second is that the entry which I assume has a good deal of weight in the eyes of the fund providers, namely the number of people whose acces to drinking water or sanitation is going to be made possible is for a number of these proposals becoming meaningless. If NGO A in conjunction with government services and c, local NGOs d,and f and private contractors g and h are going to provide water for 700, 7000 or 70,000 persons I have a hard time deciding whether A's request for fund is reasonable at all. I hope our reply to Rajesh above answers your first preocupation. PROTOS is final responsable in assuring that the funds we mobilise are used for building technically and financially sustainable infrastructures and for sound financial management. Anually we are audited at three levels, at project level, at country level, and at "NGO" level. It is our approach to facilitate and reinforce the local actors in their legitimate roles where present and not do things in their place and name. Of course this approach varies in funtion of the context; ie in Haiti en DR Congo where legitimate local government are not yet functionnel or wher the private sector is too weak we and partner NGOs still do some of the contruction works and manage the whole project cycle. In answer to your second question: we dsitinguish two levels in the beneficairies. Those who directly benefit from an infrastructure (or activity): in this case the population of 10 villages with 500-1000 habitants which presently do not have access to a modern water point and 170 housholds which do not have acces to sanitation on their compound. Without this project they would not receive this as government, NGO, and private contractors do not have the financial means to provide this investment. The second level are the indirect beneficairies, who in the long run will benefit if they have a more effective and efficient local government, civil society, and private sector. I agree with you that these numbers have to be interpreted with a certain reserve and are based on cetain assumptions which are difficult to "prove". what I do not understand in your approach is that you ask 2 questions, and seem to give your rating at the same time , without waiting for our answers or explanations to your questions. In my understanding, this is not what was intended by, nor the spirit of the Peerwater Exchange site. The first line of my intervention was clearly a comment on the format used by Peer Waters for us all to present our project, not a specific comment on your proposal. But having read your proposal as well as the answers you have provided to the various questions addressed to you, I am sorry to report to you that I find your participation in this multiple actors project pretty ill defined. The fact that you are audited for instance is pretty irrelevant to the question at hand. Nobody is accusing you of accounting sleights of hand. The question is precisely what do you do and what do the other actors do. I guess a hadn't understood your questions, and i'm still not sure what you understand under the term field executor and the relation between being one and the objectives of PWE. For 2010 we have funding from several sources (mainly EU and belgian government) which together make up a budget of around 400,000 EUR. Of this budget a bit more than half goes to financing water and sanitation infrastructure, a bit more than quarter to trainings/workshops/studies and local NGO personnel, and the rest to operational costs and salaries. We have a team based in the region which at present consists of an expat coordinator and 4 specialised national advisors (2 engineers, 1 socio-economist, 1 health&sanitation expert). We work in 14 municipalities. According to national decentralisation policy local government has become responsable for the water and sanitation sector, but they still lack the financial means and the capacities to assume this role. In rural Mali many elected officials cannot read, write, or speak french. - At the beginning of each year (ie each cycle) the investment budget is divided up amongst the 14 municipalities and the staff organises and facilitates a series of programming and planning meetings. The first series are held in each municipality where the council and local civil society representatives decide on the basis of priorities and available budget which projects to realise that year. The second meeting regroups all and these plans are then validated, the different government departments participate in these to assure alignment with national policy and other development programs. Our project staff than accompanies each municipality in all the steps needed to realise these projects (ie they prepare the terms of reference for technical studies, prepare tender documents for the recruitment of contractors, they accompany the councils in the evaluation of offers, prepare contracts, evaluate and approve the technical studies and the works, etc). So the work goes into accompanying the local governments in the whole cycle, facilitating meetings, advising, assuring quality control, assuring transparancy in tender procedures, providing the tools and documents necessary in the process. - Secondly our staff organise a series of trainings and workshops, either they give them themselves or they recruit specialists. 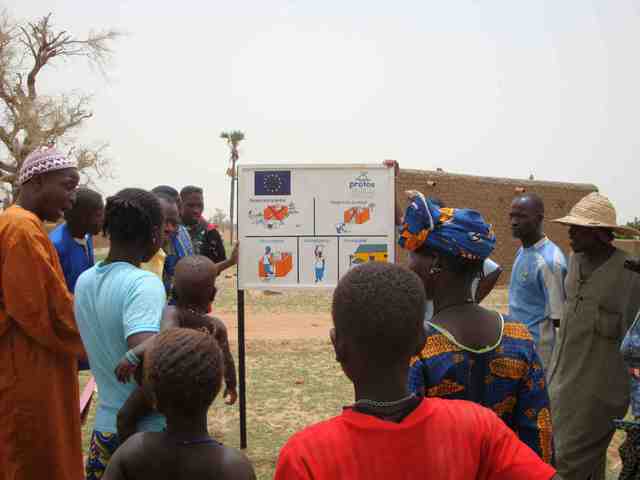 We train the staff of local NGOs recruited for extension work, hygiene and sanitation sensitisation (PHAST) in schools and communities, and the setting up and coaching of water user committees community. Our staff also monitors the performance of these local NGOs. We train local macons and techniciens. We train local government on project cycle management, on IWRM. - Thirdly our staff are responsable for setting op action-research projects which generate data and knowledge on water ressources (quality, quantity) which are used to contribute to decision making and promoting IWRM and for monitoring and evaluation. - And finally our staff does the financial management and the reporting. I hope our approach and what we do has bcome a bit clearer. I do agree with you that presenting all the contours of an approach and the details of a corresponding programme is very difficult using this format and that individual concrete building projects are more suited for this kind of peer review. Maybe this is something we should further think about. But the final objective for us all is to provide as many people with sustainable water and sanition as possible disregarding the approach, which is always very context specific. IWRM is such a broad term and it means so many things to so many people (just as sustainability). You have identified several issues, such as silting, etc. Are you doing anything about issues other than water and sanitation? Anything to reduce the degradation of the delta? btw: i scanned all the links on your Mali English page but found very little information about your work for the past 4 years. Your proposal is very good, but it would be easier to evaluate given a picture of your actual work. I agree that IWRM is a broad term with many dimensions and recognize that the name of the project might be a bit misleading, especially since our impact on IWRM in the entire Niger river basin is negligeable. We however refer to locally integrated water management where we focus on providing sensibilisation to local decisions makers and different user groups on the different functions of water, the multiple use of water, and anthropogenic impacts on water quality and availability. We do this by gathering and presenting information on the available water ressources (distribution in time and space, quality), by giving trainings and creating awareness on causes and effects of pollution/climate change/dam building, by promoting the inclusion of IWRM activites in local development plans, and by supporting initiaves to regulate water ressource exploitation by different groups (farming, fishing, and livestock communities). it is true that our webpages don't give information about achieved results. It has been a choice not to do that, because of the workload involved with this. 1. Our yearly report, issued in June (in dutch) and september (in French). 2. the detailed reports we have to make for the main subsidizing governmental agencies like European Commission and/or Belgian Development Aid. However, this reports are in French (EC) or Dutch ( Belgium). If you would like to receive a report in French, we are happy to send it, or to post it on PWX. PS: Peter Van der Jagt, who is responsible for Mali from our Ghent based South-desk is following up daily the questions of the reviewers. I have uploaded an exemple of on of our reports. I tried to upload (in word and in pdf), but i don't see it appear. Is this function no longer possible (rajesh)? This is a very complex and multi-faceted project that seems to be difficult to communicate in this format. We are still unsure as to the methodology taken in the provision of sanitation and to what extent the communities are consulted and involved in the implementation of the project itself. It is also still unclear as to how many people your organisation will target with this funding proposal and there seems to be little information available about your projects in English to allow a fuller picture to be given. I appreciate this may be labour intensive but it could be useful for peer reviews. This is a very comprehensive and well planned proposal. Protos have already secured substantial funding from very well respected development organizations in Europe and the funding they request here is minimal in comparison. This proposal will improve sustainable access to water and sanitation to the disadvantaged people in the region. One the main strengths of the proposal is that it will progressively place the responsibility for planning, coordinating, and monitoring water and sanitation interventions at the municipal level. This will build the local capacity to plan and implement a development program which clearly has both short and long term benefits for the region. The municipality have comprehensive criteria for selecting the communities they work with. The multi-sectoral approach employed by Protos will help strengthen local capacity from government down to the village level. Maintenance costs are covered by savings made by local users and Protos trained local technicians make any necessary repairs. This proposal is building on a program that has been going since 2004. There is a sound baseline of experience and knowledge that will undoubtedly increase the chances of success of this proposal. The previous phases of the program have exposed differences in coverage of safe drinking water and improved sanitation facilities across villages in the region. This information will help allocate resources to the most needy communities. In short, this is an excellent and much needed project that deserves to be supported. The first one is that there is no place where it is clearly indicated whether the NGO is the one who is directly responsible for design, execution and/or finance management or if it is contributing, encouraging, helping organize, etc other actors. PWE member are supposed to be either field executors or funders. A field executor of course can and should involve, train , mobilize local actors but it has definite responsibilities and corresponding financial burdens. I am seeing more proposals in which the actual responsibilities and what the French call are not defined.. The second is that the entry which I assume has a good deal of weight in the eyes of the fund providers, namely the number of people whose acces to drinking water or sanitation is going to be made possible is for a number of these proposals becoming meaningless. If NGO A in conjunction with government services b and c, local NGOs d,and f and private contractors g and h are going to provide water for 700, 7000 or 70,000 persons I have a hard time deciding whether A's request for fund is reasonable at all. While the title is misleading, the project reflects the deep experience Protos has and its ambition to do deep, long-term work. Hope the reporting process improves to show the continuous stream of activity and the final report also comes in English. The level of detail in this proposal is unusually detailed and comprehensive. Clearly it was well thought out. 1. The proposal is well planned and designed focussing on the communities’ dire need of drinking water, sanitation, health and hygiene issues. The needs of the vulnerable population are addressed and would be met through participatory, innovative and appropriate approach and methods. 2. It has been working for the past 30 years in the water sector and this commendable experience will prove beneficial while implementing the activity. 3. The different stakeholders are involved in the program such as local government, regional government, civil society, and private sector and water users associations. 4.For long term sustainability the main factors are ownership, transparency, accountability and capacity building of the community is crucial. All these aspects are inbuilt in the project design. Therefore definitely the project will be successful in terms of sustainability in the long run.